Apostolic Titbits: God Loves You As Much As He Loves Jesus! God Loves You As Much As He Loves Jesus! This is a true story, dates back to the British rule in India. The Pamban Bridge is situated in Tamil Nadu, India. At the entrance of the bridge you can see a picture of a weeping man holding some human body parts close to his chest. A middle aged man was appointed to roll the wheels up and down when ships arrive. Once he saw a train slowly approaching, while he was pulling back the bridge after a ship quietly passed beneath. He had to pull back quickly or else there would be a fatal accident and thousands would have died. At that time his 9 year old son came with lunch. When he saw his father struggling with the wheels, he kept the lunch box down and started helping him to roll the wheels to put the bridge back. Suddenly his son's finger got caught inside the wheel and he started crying out. At this time if the father tries to save his son, the bridge could not be put back on time. He had no other option but to ignore his son's cry. With all his strength he kept on rolling the wheels to down the bridge. As the wheels rolled on, his son slowly started slipping away into the huge machine. Tears rolled down his father's cheeks, but he ignored his son's cry. 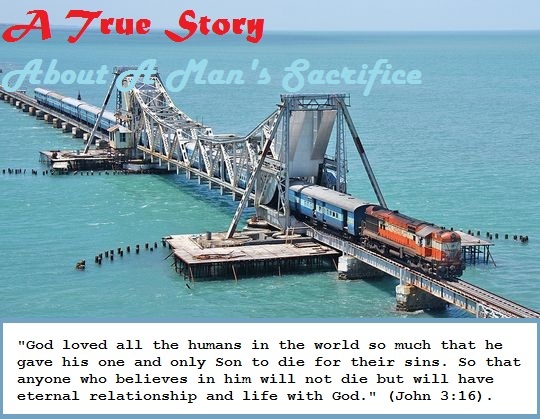 If he tried to save him, the train will surely fall into the sea and thousands of people will die. Slowly the boy's whole body fell into the machine and his father could hear his bones breaking one by one, until with a loud sound, his head cracked. The train with thousands of passengers slowly rolled on the rails, without knowing what had happened there. Though this man performed his duty honestly he lost his only loving son. With extreme lamentation, he pulled out his son's body parts from the machine and held it close to his chest and cried bitterly. Truly there are selfless people still. But what we learn from this story of love lost for a cause, we understand that love for God and people is as stronger as death (Sos 8:6). The Bible says, "Many waters cannot quench love, nor can the floods drown it. If a man would give for love all the wealth of his house, it would be utterly despised." (Sos 8:7). In other words, because of the selfless love of this father who sacrificed his son, many people who should have died, escaped it. God has such a true selfless love towards us who are sinners by nature. He knew that all of us humans would die and would go to hell if He does not choose to sacrifice His one and only begotten Son Jesus Christ. So the love that God had for us all could never be quenched by any waters of sin or the flood of the enemy Satan and his evil demons who wanted all of us to die in sin and go to hell fire which was prepared for all of them (Isa 59:19; Matt 25:41). God allowed his Son who voluntarily came to to help him in redeeming the sinful humans from imminent death (John 10:17-18). In doing so, Jesus Christ who is the Son of God incarnated to become a ordinary human by being born in a manger, because he had no other place to be born (Luke 2:7). Then he lived a sinless life of great sacrifice and then at the zenith of his life, he gave up his life on behalf of all of us, got slaughtered and died as a lamb (Isa 53:7). Even though he had no sin or did no sin, he was falsely accused by sinful human beings because God allowed him to become a sin for us humans (2 Cor 5:21). God made a divine exchange and deposited the perfect righteousness of Jesus Christ in our spiritual account in heaven. Jesus stayed silent without opening his mouth when he was falsely accused because our sins were put on him by God (Isa 53:6, 10). Then humans killed him brutally on the cross of calvary. Never forget that it is our human sin nature that killed Jesus, and as a fellow human born on this earth, we are part of his killing (Acts 2:36). But God gave a new meaning to his death by saying that Jesus' sinless body was broken was our physical healing and his blood was shed for the forgiveness of all our past, present and future sins, so that we are not only healed through believing him, but also can happily have relationship with God from now on and for eternity ahead. God the Father cried and thundered in heaven so that even the earth shook and it went dark. He was not able to bear the suffering towards the death of Jesus who was his only begotten Son, to die in the hands of sinful humans (Luke 23:44-47). Truly God has loved us humans as much as He loved Jesus His only begotten Son, so He chose to save us all through the death of His only and only begotten Son (John 17:23; Rom 8:32). Think about it saints, it is all for us. Now all we can give back to God is to believe in His Son Jesus and live for HIS GLORY all the days of our life. So be daily thankful and grateful for his sacrifice that has saved us from sin and death for eternity ahead.